"And he said, 'I heard the sound of You in the garden, and I was afraid, because I was naked, and I hid myself'" (Genesis 3:10). "And the angel said to them, 'Fear not, for behold, I bring you good news of great joy that will be for all the people'" (Luke 2:10). "Since therefore the children share in flesh and blood, He Himself likewise partook of the same things, that through death He might destroy the one who has the power of death, that is, the devil, and deliver all those who through fear of death were subject to lifelong slavery" (Hebrews 2:14-15). Once I broke a window when I was a boy. My dad wasn't home, but I feared his anger, so I hid. When he came home, he found me. He asked me what happened. I didn't want to tell him. But he wasn't angry. (Okay, maybe just a little.) "Are you alright?" he asked. My earthly father was concerned for my safety, even though I ran in fear of his anger and just punishment for my action. The natural man (that is, the unregenerate sinner) is afraid of death, the just wage for working in sin. God told Adam and Eve that if they ate of the fruit of the Tree in the Garden, they would surely die. They thought they would not die, but would instead be like God Himself. But they were deceived. Where once Adam and Eve enjoyed the presence of God in the garden, walking and talking with Him in the cool of the day, enjoying fellowship and relationship with Him, worshiping Him for what He had made - now they cowered in fear of Him, aware of their nakedness and vulnerability as a result of sin - and death as a result of sin. Adam and Eve, and every human since, has been running away from God, afraid of Him, with no hope of ever turning to Him on their own. The devil has deceived humans since the beginning that God is out to do them harm and injustice. In reality, God desires that all know Him - that all have life and that none taste death. God, desiring His people be joyous and full of life - full joy and eternal life only found in Him, which Adam and Eve had once known - decided from the before the foundation of the whole world to plan a great rescue of getting His people back, out of His everlasting love for them. "Man will always run from Us," said the Father to the Son and the Spirit. "We will not let death take all of them. We will go after them. They are helpless and hopeless without Us." And so it was that Jesus volunteered Himself to be sent into the world before the world even existed. On the night Heaven's Great Rescue Plan was heralded to the shepherds, God said, "This is the perfect time to reveal My salvation to this fearful and sinful people, always afraid of Me, yet never able to be happy or complete apart from Me. Jesus, it is time. Sound the proclamation, angels!" As the shepherds trembled in fear just as Adam and Eve had done before, the angels proclaimed: "Do not be afraid any longer! For God, whom you have been running from since the time you lived in the Garden of Eden, has come for you! Behold, I have good news: God's Son is coming to get you - to give you full joy and full life, even life eternal. This message is for all people everywhere. You first, go and see Him!" And the shepherds ran to God for the first time. They were no longer afraid, for God had shown them He loved them and had not abandoned them to death. 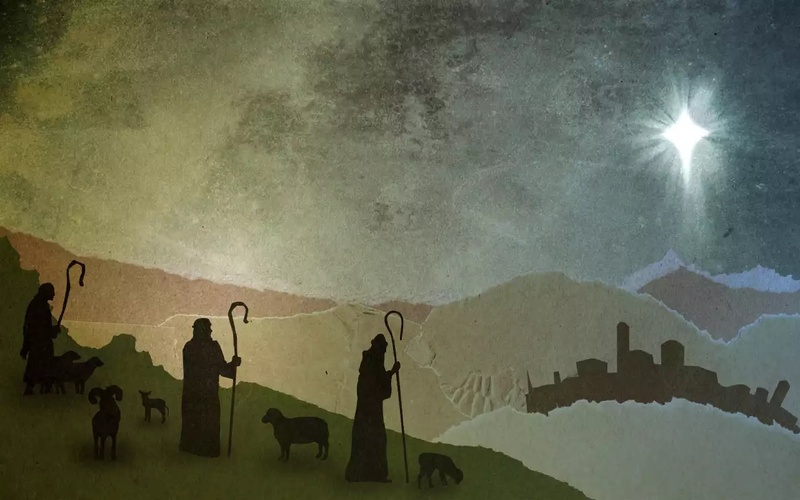 The shepherds ran the hardest and fastest they had ever run in their lives - to see their King, their Savior, their Rescuer. So it remains today: any who hear His voice and run to Him shall be saved. Yet any who reject Him will receive the judgement their sin requires: death. They will run and run and run away from the Savior and Lover of their souls directly into Sheol, from which there will be no escape. The Judgement Day approaches, bringing fear for the unregenerate, but hope because of Jesus' Great Rescue for the regenerate believer. Oh, how great is the love of God! A people who only could run for fear of God and His holiness and justice, have been rescued by the deep, deep love and grace of Christ the King! All who have ears to hear, let them hear - let them run to the stable and see their Redeemer, the baby Jesus, born in Bethlehem, and now having been through death and risen in victory, seated at the right hand of God the Father. He calls to His own even now: "Repent, for My Kingdom is at hand; and I, the King, have come to rescue you!" To make a wretch His treasure (How Deep the Father's Love For Us). LGBTQ Cannot Move The Rock Who is My Fortress!